The year 2010 start difficultly for Italian premier party. On February 10, Guido Bertolaso receives a notice of charges. For the prosecutors, the Berlusconi’s hero, along with many entrepreneurs and other members of Civil Protection, would have accepted sexual favors in exchange for contracts. On May 4, Claudio Scajola leaves his position as minister of economic development following the scandal of the house he purchased with the contribution of undeclared gifts. On May 5, Francesco Storace was sentenced to one year and six months imprisonment. According to the indictment, Storace - Health Minister at the time of the third Berlusconi government - had asked his engineers to enter illegally into files of the Rome Registry Office. 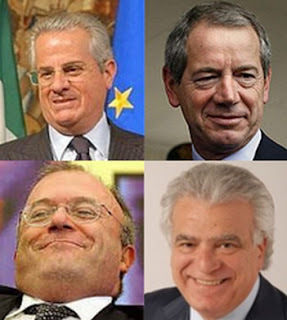 Today, May 6, we have the news of ongoing investigations against Denis Verdini - national coordinator of the People of Freedom, accused of having been part of a business committee that would have handled illicit procurements in Sardinia. We are the party of love. Love is the only thing that matters to us. For love we are ready to everything. Love, only love guides our actions. As the love for women, all women, especially all ages. We are able to do everything, even to betray our wives for the love of another woman. Because our love is big and one is not enough. Love and do what you want, Berlusconi always tells us. Yes, the history books say that St. Augustine told it first, but give us time and we’ll change that too. We will do it for love, because love is the meaning of our life, the love for everything. As the love for a house. A big house, with big rooms in a big building just how big our love is. Well, you see that all this love is wasted in a slum in the suburbs. Our love deserves to shine in the city center, at the top, visible by all and to get it we need to climb up, up, on and on, at any cost. This is the reason why we need the help of many friends, of their solidarity in times of difficult and their precious gifts, disinterested presents that must remain anonymous. Otherwise, everything would be degraded and would lose its wonderful purity. We can not allow it, because we love our love. Without our love we would not have accomplished anything in life. Above all, without your love, we could not love each other and therefore love you. It's just the love that unites us all. The News: Another day of mud to the PDL.